There is growing competition for power and influence in the Indian Ocean which is considered the world's pre-eminent energy and trade interstate seaway at the time when China and India find themselves locked in an "uncomfortable embrace." No one is better qualified to tell this story than Sir James R. Mancham KBE, Founding President of the Republic of Seychelles, the 110 idyllic islands archipelago, who was overthrown in a Marxist coup in 1977 while he was in London to celebrate the Jubilee of Queen Elizabeth II. Sir James was also the lawyer for Philco-Ford, Pan Am and RCA when the US Air Force decided to build a strategic tracking station in Seychelles to gather military intelligence over the former Soviet Union during the Cold War. As Prime Minister of Seychelles, Sir James witnessed very closely the establishment by the USA of its most modern naval, air and military complex on the island of Diego Garcia. But Sir James autobiography “Seychelles Global Citizen” is more than a political treatise about the conflict for power and influence in the Indian Ocean and about Seychelles internal political intrigue and turmoil, it is also the story of a colorful human being who has been dubbed "The Trudeau of the East" and who has also been called "The Ernest Hemmingway of the Indian Ocean." » L’air des Seychelles traduit de l’anglais par Gabriel Hoarau. Les Editions du Hameau, Paris, 1974. » Island Splendour. Preface by H.R.H. Prince Bernard of the Netherlands, Christians Verlag, Hamburh, 1980. » Paradise Raped. Methuen, London, 1983. » Galloo: Island of Many Dreams. Christians Druckerie, Hamburg, 1984. » Peace of Mind. Grainger Printing Ltd., Great Britain, 1989. » Adages of an Exile. Fleetwing Press Ltd., Great Britain, 1991. » Who’s Who in Seychelles. Printec Press Holdings (Pty) Ltd., Seychelles, 1999. » Tel Est Mon Destin: Je Fais Mon Chemin. Printec Press Holdings (Pty) Ltd., Seychelles, 2001. » Seychelles Images of yesterday. PrintecPress Holdings (Pty) Ltd., Seychelles, 2001. » War on America; Seen from the Indian Ocean. Paragon House, U.S.A., 2002. » The Sayings of James R. Mancham. Printec Press Holdings (Py) Ltd., Seychelles, 2002. » The Future of Peace in the Twenty-First Century (Co-Edited with Dr. Nicholas N. Kittrie, KtSJ) and H.E. Rodrigo Carazo under the aegis of The Eleanor Roosevelt Institute for Justice and Peace). KVK Communications Ltd., U.S.A., 2002. » Seychelles Personalities of Yesterday. Printec Press Holdings (Pty) Ltd., Seychelles, 2005. » Forgotten Eden by Athol Thomas. Longman & Harlow, London, 1968. » Seychelles Island of Love by Lawrence N. Belling. Editions Delroisse, Paris, 1971. » The Seychelles by Guy Lionnet. David and Charles Ltd., London, 1972. » Paradise in the Indian Ocean by Nozaki. (Japanese language), New Nippon Press, Tokyo, 1972. » Footprints. The memoir of Sir Selwyn Selwyn-Clarke. Sino-American Publishing Co., Hong Kong, 1975. » Seychelles Political Castaways by Christopher Lee. Hamish Hamilton, 1976. » Profession Producteur by Y. Rousseet Rouard. Calmann Levy, Paris, 1979. » Of Savages and Kings by Sara Leighton. Bachman & Turner, London, 1980. » Men, Women and Money in Seychelles by Benedict & Benedict. University of California Press, Los Angeles, U.S.A., 1982. » The Africans by David Lamb. Random House, New York, 1982. Part of JRM serialized by Reader’s Digest International in 10 languages. » V.I.P. & Co by Olga Bisera. Gruppo Editoriale Rochet, Rome, 1982. » Who’s Really Who by Compton Miller. Bland & Briggs Ltd., London, 1983. Re-published by Sphere Books, London, 1987. » Passport To Anywhere by Lars-Eric Lindblad. Times Books, New York, 1983. » Fantasy by William Davies. Sidgwick $ Jackson, London, 1984. » The New Mercenaries by Anthony Mockler. Sidgwick & Jackson, London, 1985. Corgi, London, 1986. » The Seychelles Affair by Mike Hoare. Batman Press, London, 1986. Corgi, London, 1986. » Khashoggi: The Story of the World’s Richest Man by Ronald Kessler. Warner Books, New York, 1986. Corgi, London, 1987. » My Seychelles Years by Harvey Brain. Preface by James R. Mancham. Harvey Brain, New Zealand, 1987. » Coup d’Etat by Gregor Ferguson. Arms & Armour Press, London, 1987. » World Politics Since 1945 by Peter Calvocoressi. (5th edition) Longman, London & New York, 1987. » A Grain of Sand: The Story of One Man & An Island by Brendon Grimshaw. Camerapix Publishers International, Kenya, 1996. » The Man Who Moved the World: The Life & Work of Mohamed Amin, Camerapix Publishers International, Kenya, 1998. » Predictions for the Next Millennium: Thoughts on the 1,000 years Ahead from Today’s Celebrities, compiled by David Kristoff & Todd W. Nickerson. Andrews McMeel Publishing, U.S.A., 1998. » Mission Fic Aux Iles Seychelles by Robert Smith. Mediaspaul, Canada, 2000. 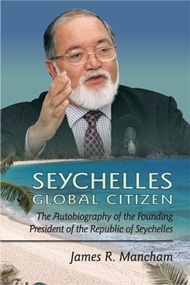 » Seychelles Since 1770: History of a Slave and Post-Slavery Society by Deryck Scarr. C. Hurst & Co. Ltd., U.K., 2000. » My Original Ambition by Dominic Shelmerdine. D.S. Publishing, New York, U.S.A., 2004. » To Be a Nation: The History of Seychelles 1920-1976 by William McAteer. 2008.